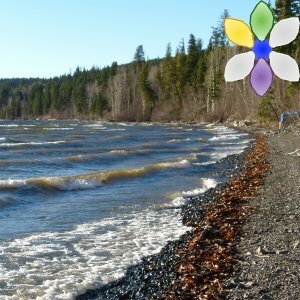 Coast Salish tribes in British Columbia, together with The Clam Garden Network, are reviving ancient clam gardens using traditional First Nations methods. These coastal gardens, maintained without the use of plastics or pesticides, provide habitat for sea life and improve local biodiversity. They also provide a sustainable, local, and healthy food source to the coastal tribes. The rock walls used for the gardens provide a buffer against storms and sea level rise, and the intergenerational practice of maintaining the gardens provides an opportunity for tribal elders to pass on their language, knowledge, and culture to younger generations.